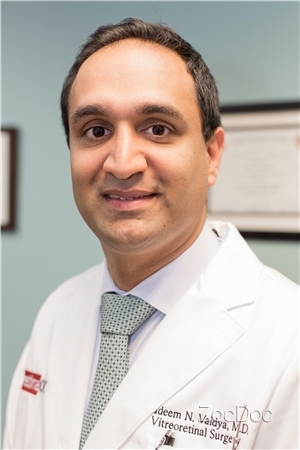 Dr. Nadeem N. Vaidya is a board certified ophthalmologist specializing in the diagnosis, treatment and surgery of the retina and vitreous. He graduated with high honors from Harvard University, and went on to medical school at the Tufts University School of Medicine in Boston, Massachusetts. During his tenure at Tufts, he was elected to the Alpha Omega Alpha Medical Honor Society. He completed his internship in internal medicine at Yale-New Haven Hospital, and completed his residency in ophthalmology at the Mount Sinai School of Medicine. He left New York for a few years to pursue subspecialty training in Medical Retina at the Joslin Diabetes Center of Harvard Medical School, where he pursued several research topics in diabetic retinopathy. Later, he relocated to Memphis, Tennessee, to pursue another fellowship in Vitreoretinal Surgery at the Vitreoretinal Foundation/Eye Specialty Group, one of the oldest fellowships in the country of this type. He returned to New York City, to join MaculaCare, a private practice retina group with Drs. Harvey Lincoff and Daniel Rosberger, two of the preeminent retina surgeons in the world. He then moved to Orange County, California to found Retina Orange County, a solo private practice in Irvine. In addition to his duties at Retina Orange County, he also practices with the Foothill Eye Group in Glendora, and with Kaiser Permanente in Riverside. An absolutely wonderful ophthalmologist. I would highly recommend him to anyone! Fantastic experience and would highly reccomend Dr Vaidya to anyone. The doctor was very good, well mannered and extremely pleasant to deal with he was very detailed in my concerns and explained everything in detail.. I'd highly recommend him! Dr. Vaidya was excellent in his approach to me as a new patient. He impressed me with his professional manner and competence in diagnosing my eye problems. I will recommend him to friends and family. He was extremely caring and knowledgeable. He answered all my questions and some I hadn't asked. A most pleasant experience, as much as any doctor visit can be. I was very happy with Dr. Vaidya's knowledge base and professional manner. He is just great. Very professional, nice and experienced. He struck me as a very proficient doctor. I felt as ease when he was administering the procedures. I would definitely see him again. He was very nice, professional, kind and explained everything that he did. Also he explained in simple langugage the results of what he found and was more than happy to answer any questions I had. an amazing care, kindness and expertise..In my opinion he is the best ophthalmologist i ever seen. He is thorough, and makes you feel special.I highly recommend him. Best doctor I have ever seen! Listens,very thorough with the exam, knowlegable even outside of his field.He is more than I expected! The staff was friendly and professional. Dr. Vaidya was knowledgable and fully explained my issues to me. Efficient and very knowledgeable. Very nice. Listened to all of my concerns and answered my questions. Did not feel rushed or hurried. He listens to all your questions and is detailed with the answers. I was completely satisfied. Dr. Vaidya gave me a thorough examination and took time to explain everything carefully to me and answer all my questions. Dr. Vaidya was great -- he was very thorough and professional and had a warm demeanor. I would definitely recommend him. Gentle, proffesional and detail oriented doctor. Awesome!!!!! I don't usually leave feedbacks, but this doctor was really great!!! Dr. Nadeem Vaidya, MD has no appointments on Zocdoc right now.